And along came the month’s subscription copies! 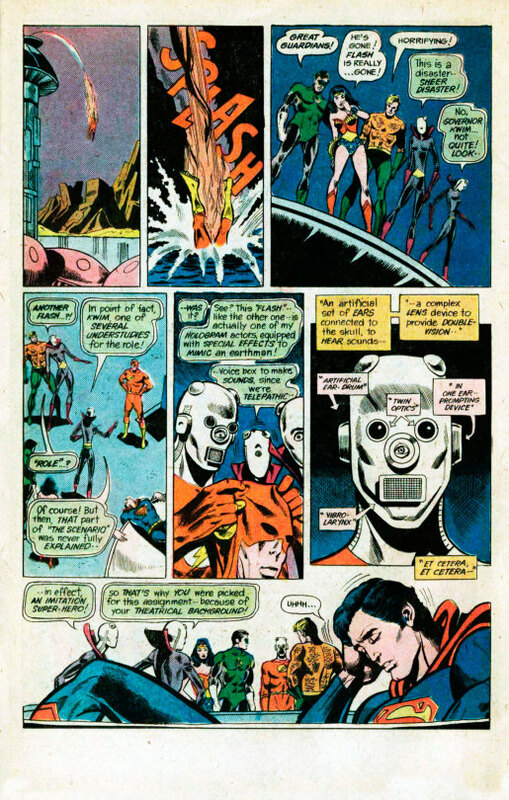 First up was JUSTICE LEAGUE OF AMERICA #133, the first half of another experimental two-parter written by Gerry Conway in which the first half and the second half only vaguely related to one another. This whole sequence was really four issues long as this month’s story picks up on the dangler from last time: where is Superman? The Ernie Chua cover once again boasts some blobby, heavy-handed linework and some weird anatomy. The story opens up with a bit of a recap, as guest-star Supergirl urges the Justice League to help her look for the missing Man of Steel and they delay long enough to recount the events that got things to this stage. Then, the narrative cuts light years across space, as we see Superman’s unconscious form drawn by an intergalactic tractor beam towards a distant planet. The one-eyed Director Ergon and Governor Kwim need his help for some dire task, but before they can revive him, they are set upon by deadly flamebirds. 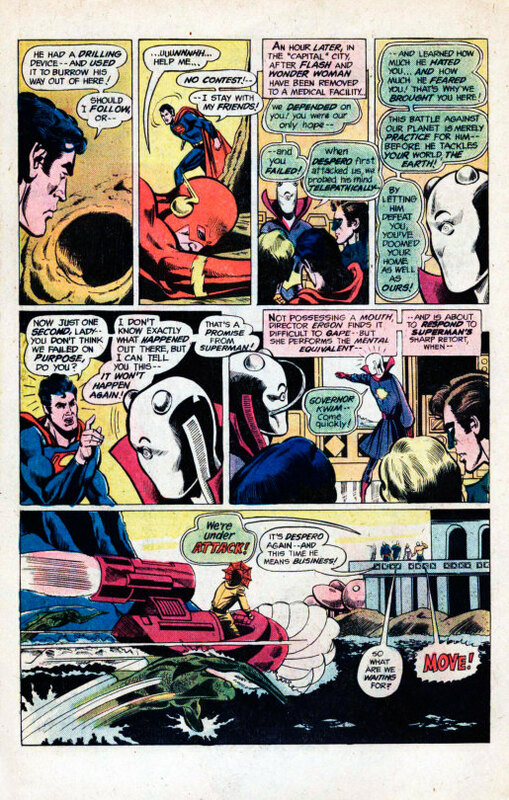 The aliens are defended by the sudden appearance of the Justice League–but the battle goes poorly, and the Flash winds up flash-fried by one of the beasts. Which is all right, as it turns out these guys aren’t the real JLAers, but rather local stand-ins assuming their roles. The Trans-Beam used to grab up Superman could only be used on a single person so they couldn’t draft the entire League. Knowing that they were abducting Superman in the middle of an Earthbound crisis, the aliens have made up their own actors as the other League members so that Superman won’t be concerned about them back on Earth and will consent to help them. And they need Superman’s help because the League’s old enemy Despero, the space pirate, has his eyes set upon swiping their Cosmic Cannon. 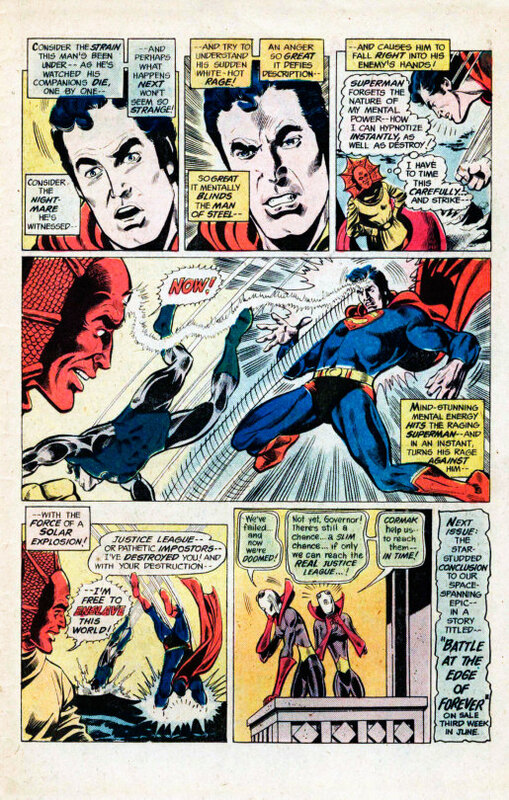 Why the aliens have such a weapon and why they don’t use it to defend themselves is tabled as Superman and the ersatz Leaguers move out to engage Despero in battle. 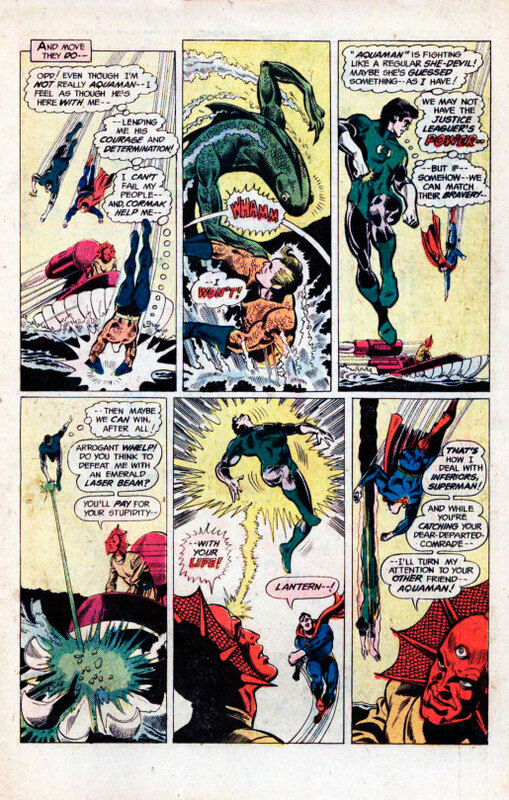 But the stand-ins are just untrained actors, and Superman is no match for Despero alone. 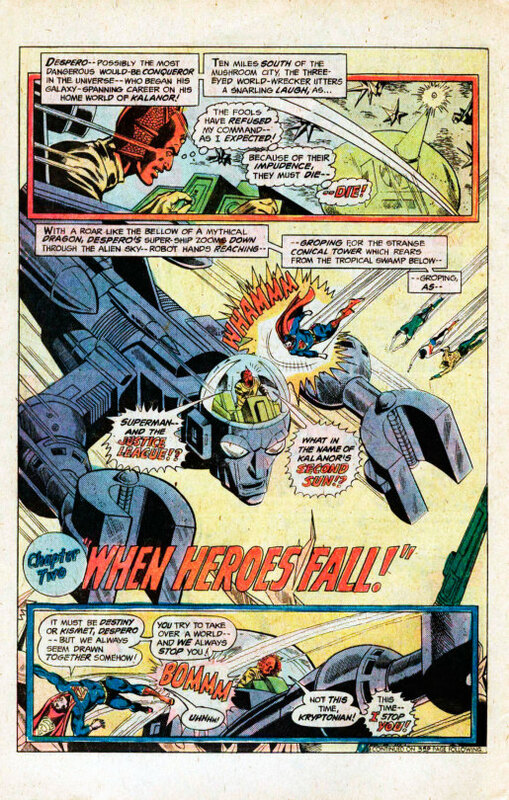 So the alien Governor orders the Cosmic Cannon to be fired against Despero–but the incompetent clod winds up blasting Superman out of the sky instead! Whoops! Now bereft of the one true super hero among them, the alien actors nevertheless step up to try to embody their roles in a GalaxyQuest sort of style. But they’re pretty hopeless, their super-powers mostly just crude special effects. And Despero is a legitimate threat, who tears through them without working up much of a sweat and escapes. In the aftermath, Governor Kwin admonishes Superman and the League, which is a ballsy thing to do given that A) you’ve got Superman here under false pretenses in the first place, B) the other guys aren’t really the JLA at all but just your own stooges, and C) you’re the idiot that had Superman shot out of the sky in the first place. But this fires Superman up and so he and the remaining fakes are ready when Despero turns up to attack the Capital. But no amount of passion is going to turn the tide here, I’m afraid. 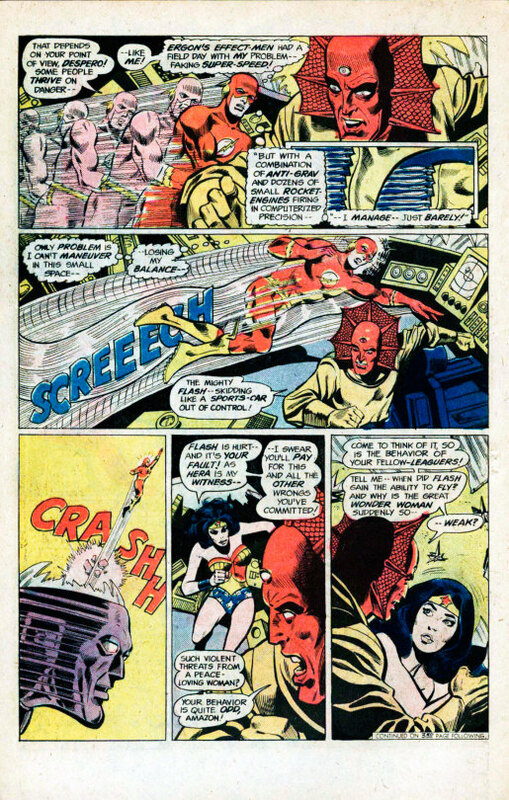 the fake Wonder Woman and Flash have already been hospitalized before the battle begins, and Despero swiftly dispatches the stand-in Aquaman and Green Lantern as well–by this point Despero has doped out that these aren’t his old enemies and he’s a bit miffed at the deception. 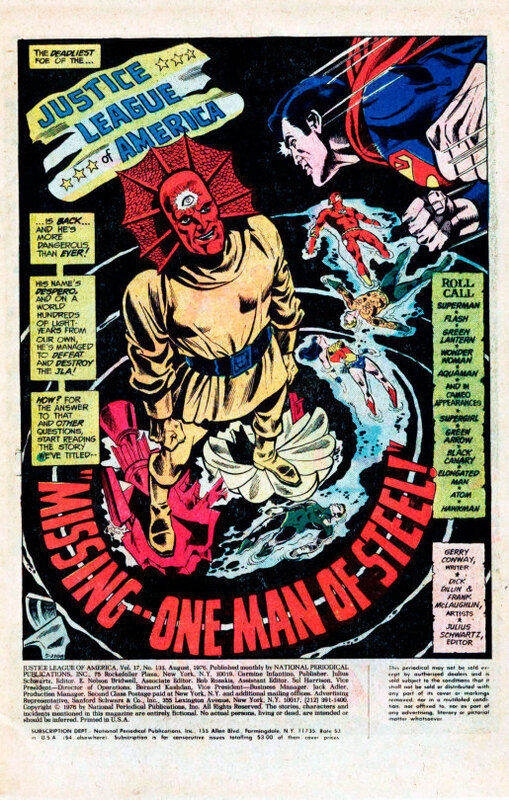 Watching what seems to be his teammates cut down causes Superman to lose his cool and attack Despero directly, and then the alien overlord takes out the Man of Steel with his telepathic third eye. There’s no hope for the aliens, unless they can somehow bring the true Justice League to their world to help them. But we’ll never know how such an event would have played out, as once again the story takes an extreme right turn next issue, as we’ll see shortly. Either way, while it has a fun idea at the center of it, this is a really weird issue of JUSTICE LEAGUE–and like a Marvel book of the period, most of it is devoted to fights, albeit fights between substitutes rather than the true heroes. 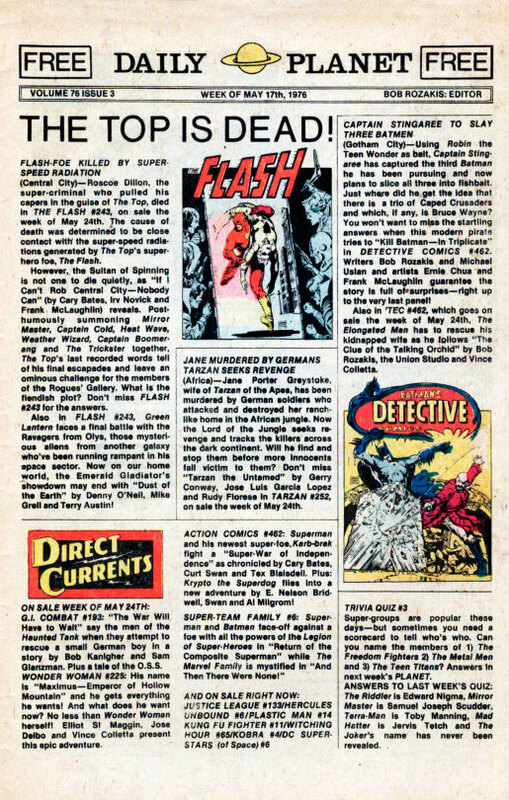 This comic also featured by first exposure to the Daily Planet, DC’s weekly promotional page designed in the spirit of the Marvel Bullpen Bulletins to update readers as to what would be coming up. I loved these pages almost as much as teh comics themselves, especially later on when they’d begin to feature Fred Hembeck’s cartoon strips and Bob Rozakis’s Ask the Answer Man Q & A columns. This one gave me my first look at the soon-to-arrive next issue of FLASH.